Join us as we explore the wildness and beauty of the Salish Sea! You will paddle past the unique and numerous islands and wildlife refuges that are part of the 172 islands of the archipelago. We’ll keep a sharp eye out for wildlife including orca whales, eagles, harbor seals and the smallest of the whale family, the harbor porpoise. When we are not on the water, there will be time for slowing down and restoration through guided meditation, yoga and forest bathing. Gain skills in kayaking and camping while nurturing what your spirit is calling for. Build community with other women and honor what is sacred in yourself and all beings. This trip is an opportunity for you to deepen your personal practices, honor your innate gifts and give yourself the time and space to recharge for the demands of your daily life. The interconnectedness of all life surrounds us and helps guide us on this magical journey. You will have the opportunity to watch the sun dip below the horizon from arguably the best sunset view in the archipelago and camp under the stars at scenic waterfront campsites. There will be an abundance of delicious and nourishing cuisine throughout the adventure. You will have time to explore and hike around Turn and Jones Islands and also sit quietly by the sea or take a plunge. The night paddle with bioluminescence is a rare opportunity to circumnavigate an island under the stars. The San Juan Islands are a magical archipelago, carved from massive tectonic events, several ice ages, and the daily weathering of wind and water. Their beauty is unsurpassed and leaves one feeling as if they have traveled to a place which exists outside the rules of the rest of the world. The San Juan Islands have a well-deserved reputation as being one of the most spectacular places in the world to sea kayak. No experience necessary; just an open heart and willingness to connect with the sacred relationships of our deepest selves, other women, and Mother Earth. We are happy to help with travel arrangements to and from San Juan Island. will be provided once you register. We can help arrange a whale watching tour for before or after the kayaking trip for those that are interested. The adventure is far from over on the last day. 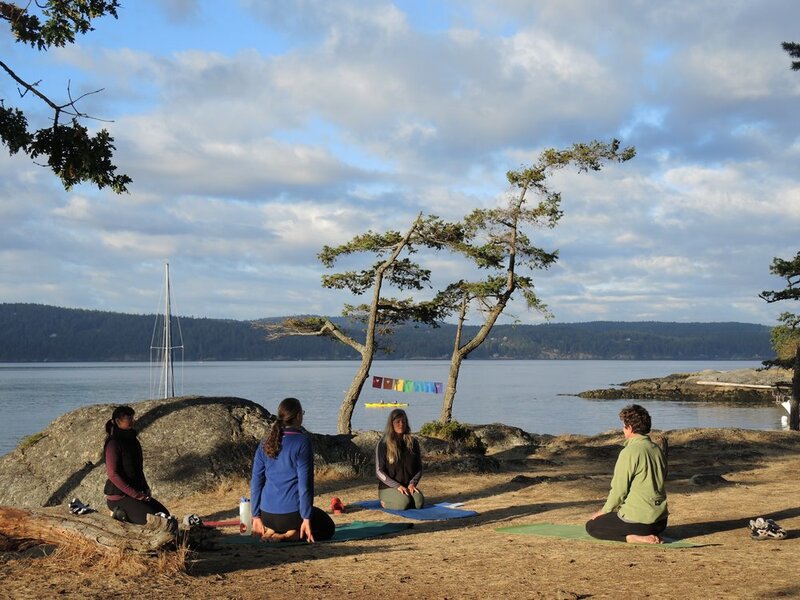 Enjoy a morning yoga session and breakfast before packing up camp and revisiting the waters of San Juan Channel. We’ll dine on one last artfully prepared lunch before completing our paddle and landing back on the eastside of San Juan Island. We’ll load our gear and our paddlers and have you back to Friday Harbor between 2-4 PM to meet your Washington State ferry or continue your time on the islands.